Today in Masonic History Joseph Hewes is born in 1730. 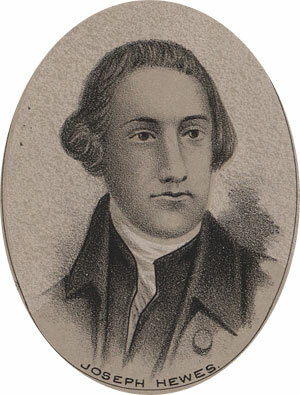 Joseph Hewes was an American politician and signer of the Declaration of Independence. Hewes was born in Princeton, New Jersey on January 23rd, 1730. He was raised a Quaker and, despite during the American Revolution straying from the general tenets of Quakerism, he remained a Quaker throughout his life. He attended Princeton University, there is no record of him graduating. Sometime after leaving Princeton, Hewes became a merchants apprentice. By 1773, his apprenticeship was over and he had moved to North Carolina. He setup a shop and was well liked in the North Carolina. Because of his reputation in North Carolina he was elected to the Continental Congress in 1774. Hewes initially was not in favor of Independence. It was not until during a session of Congress when letters and testimonials were being read stating that vast majority of members of the North Carolina colony wanted Independence from England that he changed his vote. One of the Committees that Hewes served on, during his time in Congress was the Committee of Correspondence. This was a committee used to communicate with identically named committees in the thirteen colonies. The Committee's job was to coordinate plans among the colonies and disseminate information. Traditionally Quakers are pacifists and, by their choice, do not sit on committees that have to do with war. Hewes was an exception to this and was the Secretary of Naval Affairs committee. This put him directly in charge of the warships for the Revolutionary War. When Hewes discovered that there were no ships available for the war effort, he provided his own fleet of ships, outfitted them for combat and chose captains for the vessels. John Paul Jones was one such captain. John Adams often said that Hewes "laid the foundation, the cornerstone of the American Navy." In 1776, after signing the Declaration of Independence, Hewes returned to his home in New Jersey due to his failing health. Despite his failing health, in 1778, Hewes sought reelection to congress and failed in his campaign. Early in 1779 he had his last days a Congressman. On November 10th, 1779, Hewes passed away. The following day every member of the Continental Congress attended his funeral. Hewes was a member of Unanimity Lodge No. 7 in Edenton, North Carolina.